In the corner of the Metreon food court sits Cafe X, a robotic arm serving up locally brewed coffee to patrons who order from their smart phone or kiosk. 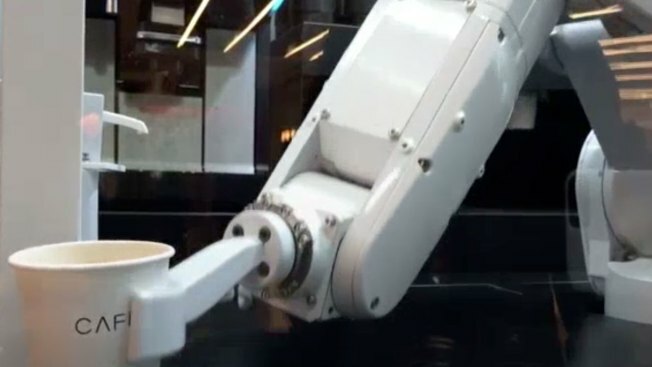 In the corner of a San Francisco mall sits Cafe X, a robotic arm serving up locally brewed coffee to patrons who order from their smart phone or at one of the kiosks. 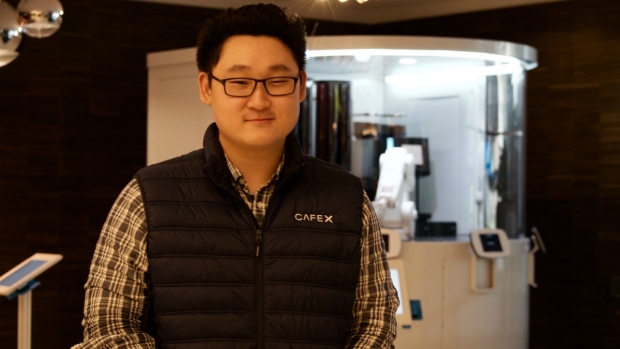 Henry Hu, 23 stands in front of Cafe X, a coffee vending robotic arm, which opened in the San Francisco's Metreon food court Monday. It features coffee selections from baristas in the Bay Area and Santa Cruz. With a sleek, transparent design, entrepreneur Henry Hu, 23, placed it in a corner just off of San Francisco's Metreon bustling food court, which features automated options in every corner. Its robotic arm remains in its encasement and operates in a similar fashion to a coffee vending machine, requiring human hands to clean espresso spills, load and maintenance the machine and get customers using the mobile ordering app. Claiming to be a taste of the future, Cafe X also features some very familiar flavors as well. Baristas from popular coffee venues in Santa Cruz, Oakland and Berkeley crafted and set the machine's options. "We partnered with local baristas," Hu said. "The roasters come out here and do all the recipes on the machine, and then once they're satisfied with something, they basically save it, and the automated system can repeatedly produce what they've set every single time." Falling two years short of his business degree, Hu is one of several fellows funded by the Thiel Fellowship, a grant of $100,000 to those under 22-years-old who have dropped out of school - or are willing to - in order to pursue their business ideas. The enterprising founder, now looks toward the possibility of launching more in company cafes around the Bay Area.